The Best Commercial Air Duct Cleaning Team In Chula Vista, CA! 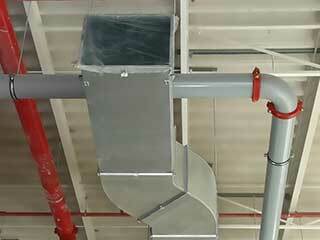 What Is The Importance Of Duct Cleaning? With all the things you must worry about already concerning your company, you might wonder why you should bother giving thought to your air ducts! For the sake of saving money and keeping up the efficiency of your employees, you should. All year round, the air ducts of your building are drawing in air to use for ventilation, air conditioning, and heating. Unfortunately, this also brings in dirt and other substances as well. They build up over time, creating clogs that can wind up growing mold and bacteria. There can be pounds of dust that have accumulated over the years if left untended to! You can be losing money in two ways. First, energy costs rise when your air ducts aren’t working well. It’s difficult for the air to pass through the build-up of materials, and managing to get enough through takes more time and energy. This can really add up in the long run! Secondly, it will take a toll on the health of your workers. Those who are free from health troubles in general will still be affected by poor air quality, suffering from fatigue that slows down their work. People with allergies will be distracted by their blurred vision and constant need to blow their noses. It’s much worse for the elderly, or employees with breathing disorders like asthma. Their health can be at risk because of the air pollution, and they may be forced to call in sick. We use only the highest quality tools available to dislodge the accumulated dirt, then immediately vacuum it up safely. This way, no cross-contamination gets in that will worsen the air of your building! Our professionals will provide careful, but swift, service so that your workers won’t need to deal with distractions for very long. We’ll be done before you know it! Air Duct Cleaning Chula Vista is ready to get to work on getting your company's air healthier today!